The day dawned sunny and bright, and we took our time enjoying our last breakfast on the flowered terrace of the Hotel Barolo. Our original plans called for us to go back to the Monferrato to visit another winery and not leave Piedmont until noon, but once we looked on the map and realized how long the drive to Siena was, we had to cancel our appointment. Instead, and because we were feeling sad about leaving such a beautiful place, we decided to take the scenic drive along route 661 and over the rolling hills and mountains of Piedmont. Therefore, we left the little village of Barolo the back way and spent the next 2 hours driving through some of the most beautiful country and lovely little towns in Italy. Also, it seemed completely unspoiled by tourists. Vineyards, sunflowers, stucco walls, crumbling castles, and glimpses of high snow-capped mountains in the distance. Eventually we made it down to the A10 Expressway and made good time to the Santa Margarita exit where we decided to stop for an hour. 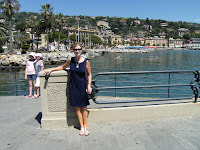 I had visited this town and Portofino in 2000 and thought it to be one of the most beautiful seaside resorts I had ever seen. It is filled with lovely pastel colored summer homes in yellow, pink, and pale green. They are covered with ornate designs, flowering shrubs and vines, and surrounded by palm trees. The water is the most amazing aqua blue with shimmering clear depths. We found a place to park near a small beach with outdoor café and a park. It felt like a perfect 80 degrees as we wandered around in the sun, stretching our legs, and gazing into the ocean. A nice respite, but wish it could have been longer. Back on the expressway, we passed the industrial mess of Genoa, and then headed east towards Florence – which we skirted – and then south towards Siena. The landscape changed, and became browner with cypress trees and small hills. Eventually we started to see sunflowers and vineyards, and knew we were in Tuscany. Driving into the hilltop city of Siena in a rental car is not recommended, but we decided to take our luggage to the Hotel Duomo first. We got hopelessly lost in the small cobblestone streets of the medieval walled city, and finally realized we were close to the hotel when we drove into the plaza of the Duomo - -the very famous cathedral. It was then that we discovered we were not supposed to drive there, and had to turn around. The hotel gave us directions to take our car back to Hertz, but of course, we still got lost and had to stop twice more to ask for directions. An hour later, we found Hertz, returned the car, and took a mad taxi-ride back to the hotel. We were sure he was going to run over pedestrians in the narrow streets. After that, we were sans-car and the trip became more relaxing. After a shower and nap, we dressed up for the fancy conference wine reception that was held at the Enoteca Italiana. It was great fun to be reunited with fellow wine professors from around the world. The welcome reception included wines from all over Tuscany and we greatly enjoyed tasting the famous Chiantis, Brunellos, and Montepulcianos, as well as some of the lighter whites and great sparklings.